The feature-packed Android Bus Ticket Booking App to ensure your traveling experience by easy booking and this application is developed mainly for the traveling agency or entrepreneurs who are mainly recommended for the comprehensive online bus booking system with tension-free travel booking and control hub management application for the business from a powerful web-based panel. In this modern world, the people are looking to save the time of joining a long queue to buy a ticket and get offer benefits by booking the tickets online. It is the right time for the travel agency or bus operators to kickstart their own Android App for Bus Ticket Booking Application for their business move to the next level online and with easy control managing hub. Our advanced Android App for Bus Ticket Booking is designed and developed by our Android experts after the detailed study of the client’s requirement and designed the comprehensive online bus reservation system that would save both time and money with mobile-friendly customization. Here the user can log in to the system by entering the registered mail id and password. The new user can sign-up their account by entering their valid personal credentials. The booking system has all requested features for e-ticket online booking, cancel the booking, my booking display, advance booking with expected dates, feedback system, etc. The Android Bus Ticket Booking App is made for the easy travel on-boarding scalable and reliable bus ticketing experience for customers. The users can enter the source & destination location and also by selecting the journey date. The listings of the buses will be displayed where the users can select their preferable bus from a variety of buses and by applying the filtering options the user can select the preferable bus from a variety of seater class, sleeper, semi-sleeper, A/C bus, and non-A/C buses. The main benefit of using this app is that the users can reserve tickets anytime anywhere via the Internet. Allow customers to check the availability of buses they prefer and book the seats of their choice. 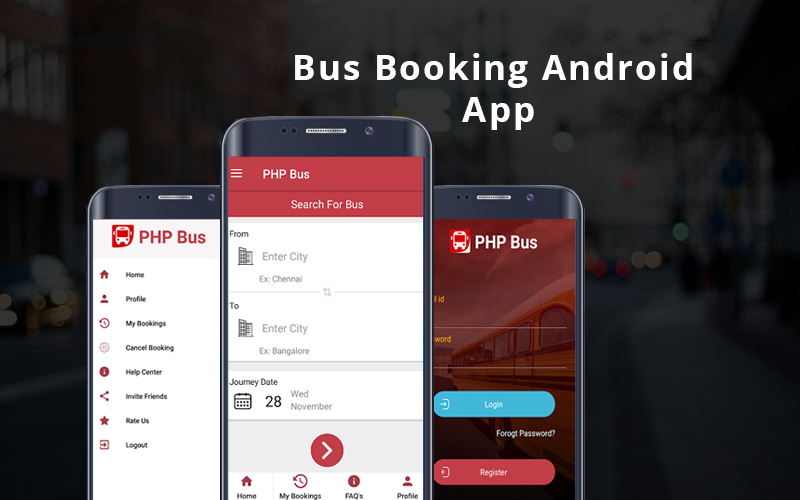 The Android Bus Booking Application has the supreme admin web-based control managing system, where the ticket, bus, and user managing system are done efficiently. Once the ticket booking is done the confirmation is sent to the respective user mail. After making their successful journey users can share their experience about the journey by giving feedback and ratings to the bus. The time to market this Android App for Bus Ticket Booking can make a seamless bus ticket booking experience to travelers and increase revenues for bus operators. Advanced Search option, Booking history, Clear listing with details, Profile management, Booking management. The additional faces implements are extraordinary work. salute to development team. This App works amazing as per my expectation level. Good user interface for the customers to use. Thankful to the team who guides me in anytime that I am in the need of technical help. I bought this App for the bus booking through online. I like this App because everything maintain through this is quick and also easy. Thank You.